Thank you for checking out my newest WooCommerce plugin Flix Carousel. The goal of this plugin was to make a WooCommerce carousel that met the following requirements. I wanted a good looking carousel to give my customers a Netflix like experience on my site. I wanted to be able to filter the carousel by tags, categories, and attributes so that I could give very specific recommendations to my customers. I wanted to be able to display as many products as I could but not impeded on site performance. I wanted it to be super easy to use. Step 1. Start writing a new page or a new post and click on the blue FC icon. Step 2. Fill out the settings form to insert your shortcode. Categories: Enter in any categories that you want the carousel to display. You must enter the category slugs so if you have something like Card Tricks, the slug would most likely be card-tricks. You can find your categories and slugs in the categories page under Woocommerce. When using mutliple categories seperate them with a comma and do not include spaces. Attribute: You must pick an attribute that you have set up. So in this case our attribute is magician and we are displaying only results from michael-ammar and jim-bob. You have to use the attribute slugs as well. You can find these slugs again in attributes under woocommerce. Items per page is how many items you want to load before the carousel has to refresh. If you are putting a lot of carousels on your page, I would recommend setting this to 10 or 15.
order (string | array) – Designates the ascending or descending order of the ‘orderby’ parameter. Defaults to ‘DESC’. An array can be used for multiple order/orderby sets. Order by (string | array) – Sort retrieved posts by parameter. Defaults to ‘date (post_date)’. One or more options can be passed. ‘none’ – No order (available since Version 2.8). ‘comment_count’ – Order by number of comments (available since Version 2.9). 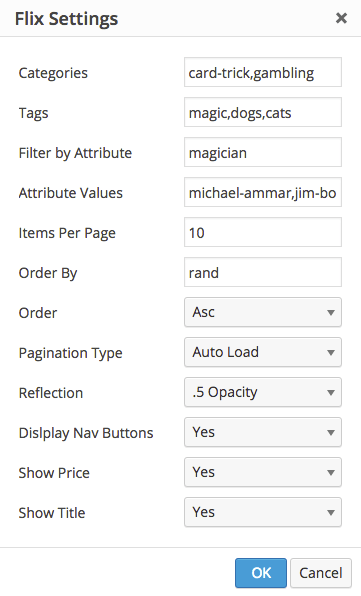 Pagination Type you can choose to have a button that your users press to load more OR you can have the infinite scrolling, “Auto Load” so that the pages load automatically… the cool stuff. Nav buttons – if you want offer your users the ability to scroll with buttons in addition to their mouse, trackpad, mousewheel, or finger if they are on a tablet/mobile device. And thats it! If you have any questions or special request please shoot me an email via the contact form.